Why Does Los Angeles Keep Rewriting Its Own Script? There’s a classic scene in the 1991 comedy L.A. Story, where “wacky weekend weatherman” Harris Telemacher, played by Steve Martin, is giving a tour around the city of Los Angeles. “Some of these buildings are over 20 years old,” he says excitedly. But that’s not the whole picture. L.A. is also a metropolis well known for its distinctive neighborhoods, diverse influences, and quirky landmarks. Even as boxy, modern condos spring up all over L.A., there’s also a growing movement of historic preservation enthusiasts. In 1880, the population of the city—really just a village then—was 11,000. By 1890, successive promotional campaigns had grown the population to 100,000. In the 1890s, the city mounted an annual celebratory La Fiesta de Los Angeles, a massive parade that attracted thousands of additional visitors as it presented a false image of happy Mexicans, charming Chinese, the Anglo flower queen and her court, and dozens of floats celebrating the agricultural richness of the land. These kinds of images still have a presence in the Rose Parade today, perpetuating a false impression of the state’s history. Fiction and non-fiction merge into a mosaic of fractured images of L.A. Think of the impressions left behind by Day of the Locust, Rebel Without a Cause, Sunset Boulevard, The Postman Always Rings Twice, Farewell My Lovely, and Chinatown—the last being Robert Towne and Roman Polanski’s view of how we stole our water from Inyo County. These movies have defined the city for the greater part of the last century. But in the age of the Internet, it may be that our view of the past is changing. Multiple blogs have begun to illuminate L.A.’s past. They are the descendants of the great, late Carey McWilliams, whose 1946 book about Los Angeles, Southern California: An Island on the Land, remains a classic corrective to the “whitewash” of our history. Anna Sklar is an Angeleno of more than 60 years. She is the author of Brown Acres: An Intimate History of the L.A. Sewers and curates the Los Angeles City Historical Society’s online photographic history of the city. We don’t need to look far beyond the familiar tropes about Los Angeles to understand why we’re fond of scrubbing our surroundings of the past. We razed historic buildings whenever a new one better suited our immediate needs. We paved over our native flora and planted an exotic forest of palms, eucalypts, and other evergreens in its place. We asked engineers to tame the destructive excesses of our local hydrology and, in the process, lost our most tangible links to the deep past. We did all of that because schemers and utopian dreamers built our modern city as a land of self-reinvention. We were living out their grand visions. Much has changed. The heroic efforts of architectural preservationists and environmental activists have permanently inscribed the past into our built environment. Even if the pace of erasure has slowed, though, when it comes to telling stories about itself, Los Angeles has always been more likely to mythologize its past than erase it outright. It’s a tradition stretching back to the late 19th century, when we reimagined the region’s pre-American history as a Spanish romance. I wonder if we’re still misusing our past. Consider the ongoing transformation of the city’s historic core. Step into just about any downtown gastropub and you’ll inevitably see, framed and mounted on the walls, glamorous images of the neighborhood as it appeared some 75 years ago: dazzling neon signs, trolleys, and sidewalks choked with men and women in hats. By linking these new enterprises with the prosperity of the past, these photographs quietly justify downtown’s reinvention as a playground for young urbanites (myself included—I’m a resident). At the same time, they omit more recent history. Broadway, for example, remade itself into a vibrant shopping corridor for L.A.’s Spanish-speaking population as department stores moved to the suburbs in the 1970s and 80s. Now a new wave of chic retailers and hipster hotels are pushing out Latino-owned businesses. As newcomers sip craft beers, surrounded by unreliable reminders of a dubious downtown heyday, a Latino cultural hub fades into history. Nathan Masters writes about Los Angeles history for KCET on behalf of “L.A. as Subject,” a research collective hosted by the USC Libraries. His essay about the historical development of L.A.'s street grids appears in LAtitudes: An Angeleno's Atlas. There is a central paradox in L.A.’s relationship to its past: The city is relatively young, and yet, because of a vigorous historic preservation movement that started in the late 1960s, it’s on the path to becoming exceptionally well preserved. L.A.’s architectural history has been unusually well sustained, especially the stock of its first permanent housing. As a result of fires, floods, and the serial redevelopment of urban lots, East Coast and Midwest cities long ago lost the original housing built on open land or agricultural fields. 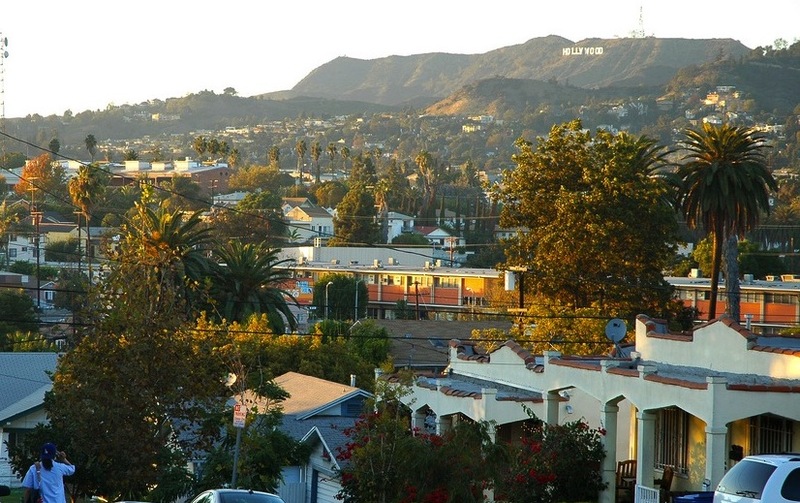 L.A.’s relative advantage is due in part to when its population boomed. Its population more than doubled in the 1920s, reaching about a million and a quarter by 1930. In response, a great wave of construction put homes onto bean fields, ranches, and lands that had been used as transitory residences. Unlike the first developments in older cities, a great bulk of L.A.’s original construction occurred after the passage of a series of housing laws to improve resistance to fires and floods. Then the destruction of Penn Station in New York City in 1963 transformed feeble and scattered preservation efforts into a national movement. Over the next 20 years, national historic regulations were put into place, local conservancy societies gained support, and something radically new was added to the movement: a drive to preserve residential neighborhoods. As new housing development moved away from the city’s center, preservation energies moved in. The upshot to this unplanned history is that L.A. has a rapidly expanding necklace of officially designated historic neighborhoods. In the future, the preserved original structures in L.A. will be old enough to be recognized as historic in the more familiar, long time span used to perceive “historic” in older cities. L.A.’s image as a city that cares nothing for its past will shift to that of a city that has succeeded in preserving its original structures more successfully than any other large U.S. (and perhaps European or Asian) city. Jack Katz is professor of sociology at UCLA. He is completing a book on six residential areas in Hollywood, using historical records, interviews, and observations to trace their origins in the 1870s through the multiple transformations that have led to their contemporary diversity. We often bring a mental picture of a place long before we actually see it. In the case of Los Angeles, that picture is unusually deceptive. Three powerful myths get in the way of seeing it clearly. First, there is the booster image, engendered by the Chamber of Commerce from 1890 to 1930, about sunny Anglo real estate. Then there is the Hollywood myth of dark streets filled with existential irony and remorse; the mental residue of thousands of films. And finally, there is the myth engendered by the freeways to see a donut of concrete at 70 miles an hour. Over the past 30 years, two new mental pictures have been added to the optical illusion. One is ethnographic, about the overlapping realities provided by immigration—a rapid shape-shifting from one generation to the next, media fantasies versus the real changes in neighborhoods. Another is the rediscovery of dozens of small towns (like Highland Park, 1895) that had been annexed to the city between 1895 and 1925. Until lately, they were mostly ignored. Now they are the scenes of fierce real estate revitalization. At least the newer myths bring us closer to street level, where people actually live and intersect. Their rhythms are suddenly more visible. Perhaps now we can see what has always been there. Norman M. Klein is the author of The History of Forgetting: Los Angeles and the Erasure of Memory. His newest book, The Imaginary Twentieth Century, will be out later this year. This was written for Open Art, a partnership of the Getty and Zócalo Public Square. Primary Editor: Alexis Hauk. Secondary Editor: Becca MacLaren. *Photo courtesy of Clinton Steeds.